Instrument transformers and sensors are used in electric distribution networks to measure the current and the voltage for metering, monitoring, and protection and control use cases. Multiphysics simulation is an integral part of research and product development at ABB. In fact, modeling has helped the organization to minimize the number of physical prototypes, reduce the development time, and develop the next generation of sensors and instrument transformers. During this webinar, Nirmal Paudel, senior R&D engineer at ABB, will discuss how to model a split-core sensor for medium-voltage use cases, considering how the accuracy of the sensor depends on various geometrical parameters, the sensor orientation, and the influence of nearby conductors in a three-phase system. Key steps in modeling instrument transformers and sensors using multiphysics simulation will be discussed. Simulation results of different sensors will also be shown. The webinar will include a live demo in the COMSOL Multiphysics® software that features a split-core sensor for use in an underground vault. The webinar will conclude with a Q&A session. 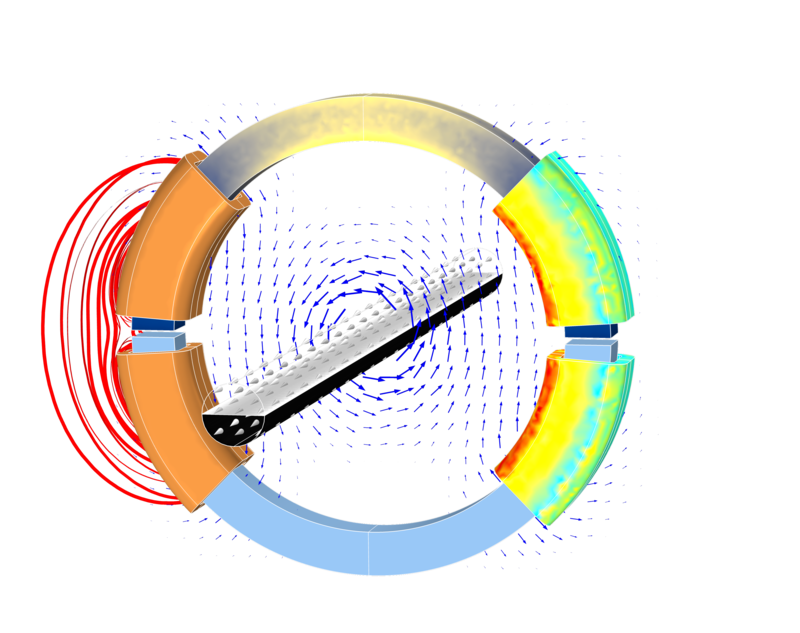 3D model of a split-core sensor depicting the magnetic flux density in the core (top), magnetic flux lines (left), current in the primary conductor (center), and current density in the windings (right).